The waiter in the sea-view-restaurant handed us the menu and then said proudly with a big smile: And …we have fresh lapas! He saw the question marks in our eyes and continued: It’s typical shellfish from Lanzarote, it’s like mussels… but different, it’s very good. No need to have this said twice, lapas ordered as a starter for the whole table. A few minutes later a big tray of fresh grilled limpets (marine snails with conical shaped shells) arrived, beautifully decorated with green mojo. They tasted indeed different from mussels, with meat a little bit of harder consistency and more chewy, but a yummy treat for sure. The introduction to the mojo, another local specialty, was given to our group the day before during the first meal in Lanza. The accompanying sauce comes in two colours. 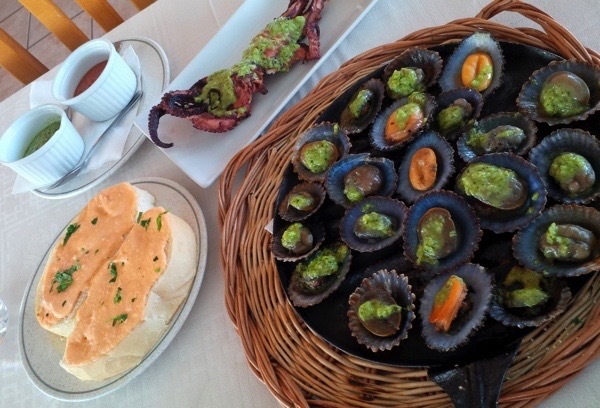 The green and red versions are practically served with every dish there and one can enjoy it with seafood, the local small Canarian potatoes or on bread. Believe me or not, after a few days you simply get addicted to the stuff. The ingredients may differ from restaurant to restaurant but the basics for the green version (mojo verde) is parsley, coriander, green peppers, avocado, oil, vinegar, and garlic. While the red one (mojo rojo) is often spicy and has tomatoes, red peppers, cumin, and red chillies in it. Lanzarote is the fourth largest of the 12 Canary islands and the one closest to the African continent (125km). The island is famous for its red colours (Montagna del Fuego), the Cactus Garden, the art design from César Manrique (basically all around the island), and last but not least for the very good island-grown wine. Later, while discovering the island, I was taking a stroll on the beach next to El Golfo (a green coloured lake next to the sea shore). On the black sand there were a few big stones in the water with several lapas having their conic tops washed up by every wave. 2 Responses to "Food Postcard: Lapas and Mojo"
Sounds delish! Love mojo sauces– we eat them a lot in Texas and Mexico!